Another book off the Hugo pile, this one a bit reluctantly added to my TBR list because I've read most of the nominations for Best Novel and thought I ought to at least try this one out, even if my heart (and vote) belongs to others. Anyway, the basic premise of The Collapsing Empire is that humanity has expanded off Earth and built a bunch of places it can survive, mostly off-world habitats, which it has discovered are linked together by a thing called the Flow. This allows faster-than-light travel but it still takes ages for anyone or anything to travel from one end of the Interdependency to another. Humanity is also subject to a semi-feudal system with an emperox on top and guilds with monopolies, with one of those guilds pushing for more influence by both playing both sides against the middle in a distant civil war and trying to get one of its heirs married into the imperial family. The problem is, as the title of the book suggests, the Flow is collapsing and soon the different places where humanity is existing will start to become unconnected, as one of our protagonists is sent off to tell the current emperox. The research his family have been doing is semi-secret, so a botched version of it has been used by the guild who are messing everyone about because they think things are just shifting and their newly-acquired planet will become the centre of things. 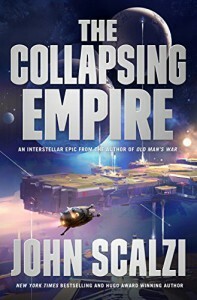 The main problem I had with The Collapsing Empire, while I usually quite enjoy a bit of space opera, is that I found myself not giving a crap about most of the characters - the one relationship I was interested in, that of the new emperox and her republican assistant gets abruptly severed just as it was about to get interesting. The villains twirl their moustaches with little sense of real menace, while the 'heroes' are either two-dimensional caricatures or just bland. Swearing a lot and being sexually voracious are no replacements for characterisation. As a result, I'm left with a book that some people will probably love to bits and where I might pick up the sequel (The Consuming Fire, out in October 2018) if I come across it at the library, but I probably won't.